WASHINGTON -- Thirty-four U.S. nuclear missile launch officers have been implicated in a cheating scandal and have been stripped of their certification in what the Air Force believes is the largest such breach of integrity in the nuclear force, Air Force Secretary Deborah Lee James said Wednesday. The officers apparently texted to each other the answers to a monthly test on their knowledge of how to operate the missiles. The number includes officers who did the cheating as well as those who may have known about it but did not report it. The cheating, which was discovered during a drug investigation that included two of the 34 officers, is the latest controversy involving the service members who maintain and operate the nation's 450 nuclear missiles. "This was a failure of integrity on the part of some of our airmen," James said. "It was not a failure of our nuclear mission." In all, the drug scandal encompassed 11 Air Force officers across six bases in the United States and England. Of the three missile launch officers involved in the drug scandal, two were at Malmstrom Air Force Base in Montana and one was at F.E. Warren Air Force Base in Wyoming. The two at Malmstrom were among those implicated in the cheating scandal. James told a Pentagon news conference that 600 missile crew members across the Air Force were retaking the test, including nearly 200 at Malmstrom. She said that the missile force needs attention and that while immediate corrective action is being taken, Air Force leaders are planning to address some longer-term initiatives. The Air Force said the cheating took place late last summer. 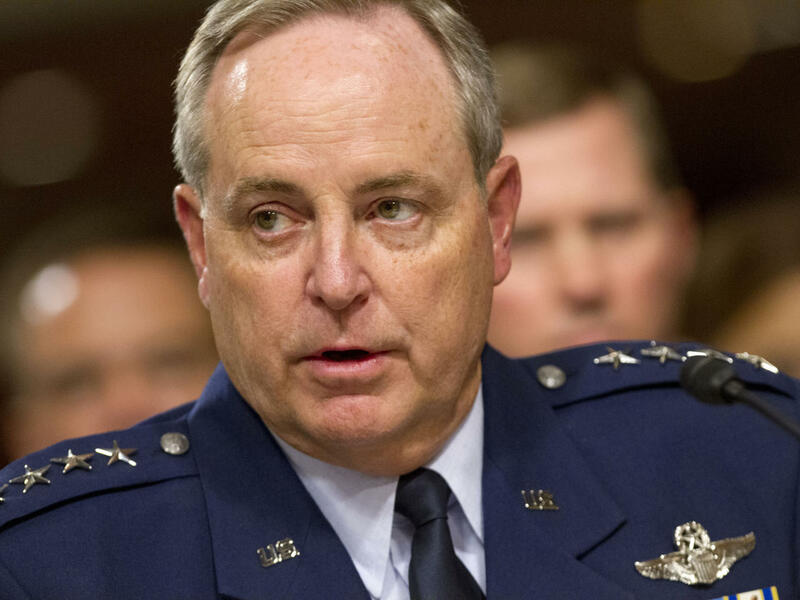 "Regardless of an airman's level of participation, cheating or tolerating others who cheat runs counter to everything we believe in as a service," said Air Force Chief of Staff Gen. Mark Welsh. "People at every level will be held accountable if and where appropriate." Welsh said that the cheating scandal might be the worst ever to hit the nuclear forces. "We do not know of an incident of this scale involving cheating in the missile force," he said. Launch officers have to pass other monthly tests as well, including a simulated launch, so the cheating probably says more about their integrity than about their ability to perform the mission. "It's hard to cover up incompetence cheating one time on a test when you're going to have a monthly simulator with two instructors watching you actually conduct the practical application of this knowledge in a simulator," Welsh said. "You can't hide that." The 34 represent just under 20 percent -- one in five -- of the missile launch officers at Malmstrom. "They are restricted from missile crew duty," Welsh said. "Their security clearances have been suspended." Last week the Pentagon disclosed the original drug probe of a total of 10 officers - nine lieutenants and one captain - at six bases. It provided few other details beyond saying the officers were suspected of possessing "recreational drugs." That has now expanded to 11 officers. The matter is being probed by the Air Force Office of Special Investigations. The Associated Press has reported that the Air Force's nuclear arm has been weighed down by a series of problems involving security lapses and morale-related issues, leading one officer to complain of "rot" in the force. The original disclosure of a drug investigation said the officers alleged to be involved were at Edwards Air Force Base, Calififornia; Schriever Air Force Base, Colorado. ; Royal Air Force Base Lakenheath in England; Vandenberg Air Force Base, California; and two bases that operate intercontinental ballistic missiles - F.E. Warren and Malmstrom. First word of the investigation came last Thursday moments before Defense Secretary Chuck Hagel appeared at F.E. Warren to deliver a pep talk to members of the 90th Missile Wing, which operates 150 ICBMs. Hagel did not mention the drug probe but praised the missile force for its dedication and professionalism.